The time is now, the place is Dizgraceland, and what you don't realize is that this blog happens to lie on the outskirts of the Twilight Zone. (on being born on Christmas Day, 1924) "I was a Christmas present that was delivered unwrapped." I miss Rod Serling. If he was still alive (physically), he would be 81 years old this Christmas. But he collapsed while mowing the lawn in 1975 and died because the artery leading to his heart had disintegrated. Kind of an ordinary way for the creator of the Twilight Zone to die. You would have thought he would have simply disappeared in a puff of smoke (considering the man even chain smoked while narrating the Twilight Zone). Rod was a major inspiration to me. He frightened the bejesus out of me as a kid. I think the scariest was "Nightmare at 30,000 Feet", in which William Shatner sees a gremlin (the monster, not the car) tearing at an airplane wing out the window of an airliner. I had my own nightmares about that one. I still think about it when I fly and happen to be sitting near the wing. But 9-11 has given us real boogeymen to worry about. I suppose that is why I've always liked stories about the supernatural. For some reason, it is much easier to deal with a gremlin ripping apart a wing than a terrorist taking over a plane in real life. Reality is unfortunately too often more terrifying than fantasy. I wonder if that is part of what motivated Serling. He served as a paratrooper in World War II and apparently suffered from combat flashbacks and insomnia. Maybe it was easier to deal with the demons in the twilight zone. But the really cool thing about Rod Serling was that he used his fantasy programs to deal with real life issues such as racism, Cold War paranoia and the horrors of war. In an era when we were being fed sanitized life by I Love Lucy and Ozzy and Harriet, that was pretty progressive. So anyway, I know it seems like an odd topic for the holiday season, but here's to Rod Serling and the Twilight Zone. Happy birthday, Rod. Hope you found a dimension of happiness out there. 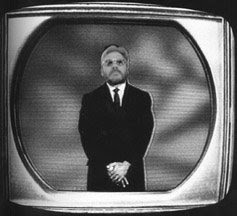 I've never been much on TV but I do remember liking this one and yes it would scare the bah jibbers out of me. They would have this strange twist at the end that made you fill like it really could happen. Nice post, thanks. The guy was truly ahead of his time. But, he's back, reincarnated as what's his name hosting "Survivor". I loved the twilight zone. I still get goosebumps hearing the lead-in to the show. The gremlin one was my favorite. I still think about it everytime I'm on a plane as well. My aisle-companion doesn't seem to appreciate it when I whisper "There's... something...out on the.. wing!"